After my upgrade to KDE 4.4, I noticed that kopete's facebook plugin was making kopete crash just when it connected to facebook. 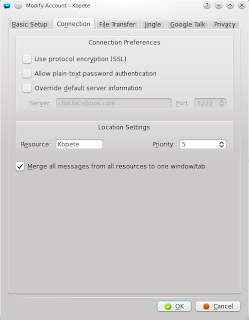 While looking for an updated version of the plugin I ran across this blog post from duncan mcvicar's (one of the lead developers of kopete) explaining that there wasn't a need for that plugin anymore since Facebook added XMPP support for their chat service this week. 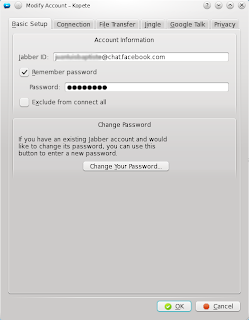 Now, you can use any jabber client to connect to Facebook's chat. Duncan's blog post is missing details about how to accomplish this so I'm going to explain how to setup your chat account here. That's it, you now will be able to connect to facebook chat service from kopete and avoid opening a browser just for that. KDE 4.4 available for Mandriva 2010 ! !